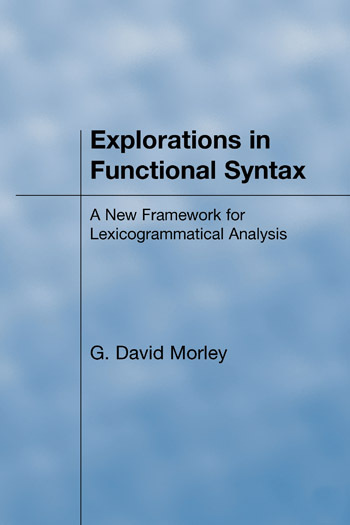 Explorations in Functional Syntax develops a practical framework for analysing the syntactic structure of a text from a functional perspective. It outlines a model in which the syntactic analysis, on a single dimension, mirrors the multidimensional meaning structure of the text. The syntactic framework thus takes account of semantic concepts such as participants and things, processes, features and qualities, and circumstances, all of which constitute elements of ideas. But it also deals with the cohesive links which connect ideas and with personal comments, etc. which may be interspersed amongst them. Though set firmly in the mould of systemic functional grammar, the book focuses on lexicogrammatical units and relations, structural elements, configurations and complexities. Social context and the semantic stratum are sketched out only as essential background. In elaborating a unitary syntactic framework which is functionally orientated so as to reflect the meaning structure of a text, the book represents a significant departure from the ‘standard’ mode of handling lexicogrammar in systemic linguistics. Important differences have been introduced with regard, firstly, to the nature of units on the rank scale and their relationships to structural complexes and, secondly, to the range and scope of elements of clause structure. The book is well illustrated with examples of the descriptive framework in action throughout the text and in a summary end chapter.